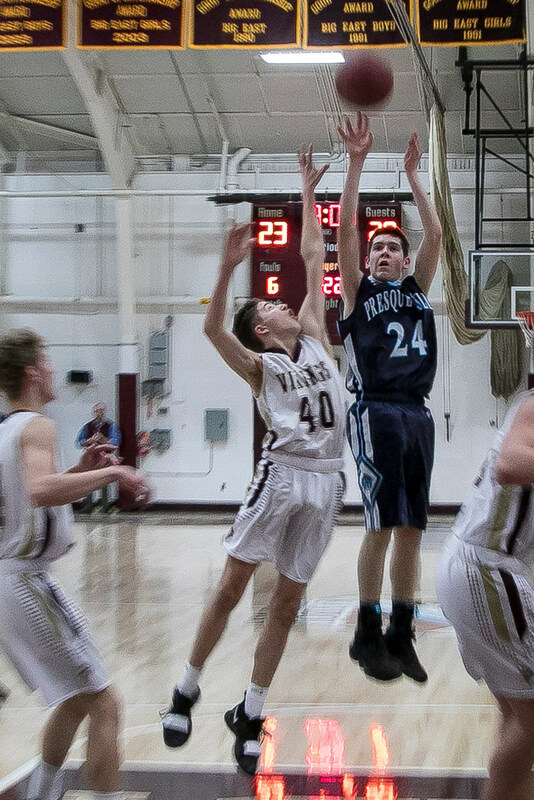 CARIBOU, Maine — It did not come easily, which should be expected when going up against their top rivals, but the Vikings put a bow on their brilliant regular season with a 71-58 boys’ varsity basketball win over Presque Isle Thursday in front of a boisterous crowd at Caribou High School. 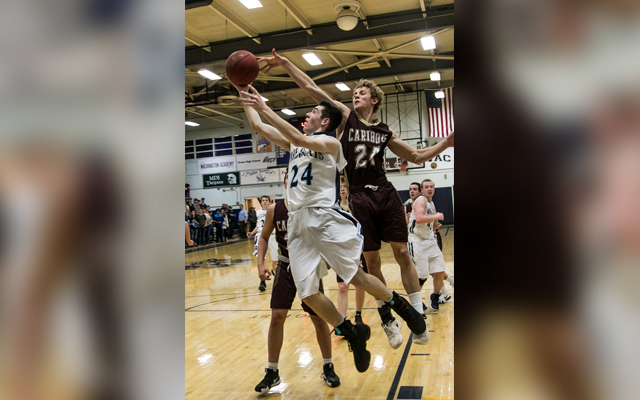 Caribou closed out the season with a 12-game winning streak, along with a final record of 15-3, and now advance straight into the Class B North quarterfinals as the No. 2 seed. The Vikings will play either No. 7 Orono or No. 10 Washington Academy on Friday, Feb. 15 at 6:30 p.m. at the Cross Insurance Center. Presque Isle ended up 8-10 and in eighth place. The Wildcats face No. 9 Foxcroft Academy in the preliminary round of the playoffs Wednesday at 5:30 p.m. The winner takes on No. 1 Hermon (18-0) in the quarters on Saturday, Feb. 16, at 3:05 p.m. The visiting Wildcats were able to break out to a 7-1 lead before Caribou scored seven in a row to go in front. A late run to end the first quarter allowed PI to grab a 13-9 advantage. A 24-10 spurt in the second period put Caribou ahead at halftime, 33-23, as the Vikes were able to get their transition game going. The big basket for the Vikes came with 1:39 left when Isaac Marker was fouled as he converted a 3-point basket. He hit the free throw to make it 31-20. Cole Paterson’s 3-pointer as the buzzer sounded gave PI momentum into halftime. Paterson also scored his team’s first five points of the third, but Parker Deprey nailed a couple of 3-point field goals for Caribou as the Vikings took their largest lead (43-28) when Austin Findlen nailed a pair of free throws at the 6:05 mark of the period. A 12-4 run, including single buckets by Caleb Wheaton, Jacob Sjoberg, Trace Cyr and two by Jonah Hudson, got PI within eight, but Marker hit consecutive shots to keep Caribou in control. 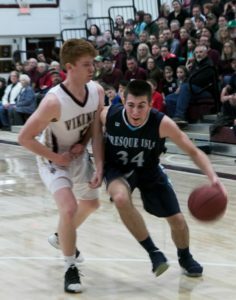 In the fourth quarter, PI had a chance to cut the deficit to six points on a Hudson 3-pointer with five minutes to play, but the Wildcats missed a couple layups and Caribou answered with back-to-back 3-pointers by Austin Findlen and Alex Bouchard to stretch the lead to 12 and the Vikes held on. The teams combined for 17 3-pointers and they shot them at a high percentage. Caribou hit 10 and PI had seven. Parker Deprey scored 24 points, Marker added 17 and Findlen 11. Sawyer Deprey grabbed a game-high 15 rebounds to go along with his eight points. Hudson paced PI with 19 points. Wheaton tallied 14, Paterson netted 10 and Sjoberg finished with eight. “I thought we did a great job battling back from down 15 in the second half,” said Wildcat coach Terry Cummings. “We did a better job rebounding and had a couple players [Paterson and Sjoberg] who weren’t starters earlier in the year with good offensive games. “But Caribou puts five kids on the floor that can score, and score in bunches, so they are tough to beat,” he added. Corrigan said his team has surpassed their preseason goals and he is excited to prepare for the Class B North tournament.